SKIN CLEANSER 12 OZ. - Gentle Cleansing & Fragrance Free Formula with Botanical Extracts Hypoallergenic & pH Balanced Vegan · Biodegradable NutriBiotic Sensitive Skin Non-Soap Skin Cleanser is a gentle, hypoallergenic, and non-drying formula specifically designed for individuals with skin sensitivities and allergies to fragrance. The deep cleansing action removes impurities and leaves no pore-clogging residue. Rich botanicals, including grapefruit seed extract, leave your skin feeling fresh and clean. Plant moisurizers help maintain your skin's moisture mantle and pH balance. Made without sodium lauryl/laureth sulfates, cocamide DEA, free chlorine derivatives, GMOs, colorings, animal products, fragrance, and paraben preservatives. SKIN CLEANSER 12 OZ. - Fragrance Free Formula with Aloe Vera and Grapefruit Seed Extract Hypoallergenic · pH Balanced · Paraben Free Vegan · Biodegradable NutriBiotic Original NonSoap Skin Cleanser is a vegan formula specifically designed for individuals with sensitive skin. Gentle and non-drying, its deep cleansing action leaves no pore-clogging residue. Plant moisturizers from aloe vera and oil of coconut are combined to maintain your skin's moisture mantle and pH balance. Ideal for normal to oily or combination skin types. Made without sodium lauryl sulfate, cocamide DEA, free chlorine derivatives, colorings, animal products, fragrance, gluten, GMOs, phosphates, and paraben preservatives. SHOWER GEL, Vanilla Chai 12 oz. Whole Body Moisturizing Shampoo with Botanical Extracts Non-soap Hypoallergenic & pH Balanced Paraben Free Vegan · Biodegradable NutriBiotic Vanilla Chai Super Shower Gel is a moisturizing, non-soap, vegan, cleansing formula designed for your entire body, including your hair. Gentle and non-drying, its deep cleansing action leaves no pore-clogging residue. Plant moisturizers help maintain your skin's moisture mantle and pH balance. Ideal for all types of skin and hair. Made without sodium lauryl/laureth sulfates, cocamide DEA, free chlorine derivatives, GMOs, colorings, gluten, phosphates, animal products, and paraben preservatives. CELLFOOD OXYGEN GEL - A unique, soothing nutrient-rich replenishing gel that helps to renew skin texture, making it softer, smoother, and firmer. Cellfood's highly advanced, paraben-free oxygenating gel formulation promotes a more youthful looking complexion for all skin types. MSM CREAM - MSM (Methyl-Sulfonyl-Methane) is an organic source of sulfur. Sulfur is found in all cells and tissues and is critical to the health of our skin and nails (in addition to bones and joints). MSM Cream is a balanced formula that contains aloe vera, jojoba oil, tea tree oil, vitamin A and D. This exclusive formula also contains Citricidal (derived from the seed and pulp of grapefruit), which acts as a natural broad spectrum antimicrobial. 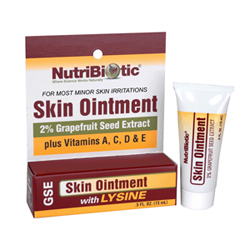 SKIN OINTMENT - is designed for most minor skin irritations and to help support healthy tissue. Contains lysine, goldenseal, echinacea, Citricidal brand grapefruit seed extract, olive and tea tree oils, vitamins A, C & E, and more! ECZEMA - Formulated for symptoms such as inflammation, itching, pain and sensitivity associated with eczema, psoriasis, sunburn, rashes and other skin conditions. ACNE - Formulated for symptoms associated with acne and other skin conditions such as boils, pimples, pustules and sebaceous cysts. HEMORRHOID LOTION - Formulated for symptoms associated with hemorrhoids such as itching, inflammation, engorgement and stinging, burning pain. POISON IVY - Formulated for symptoms associated with poison ivy, oak and sumac such as itching, burning, pain, swelling and blistering. ROSACEA - Formulated for associated symptoms such as skin changes, discoloration and discomfort of the skin on the face, neck and scalp. WARTS - MOLES - SKIN TAGS - Formulated for various types of skin conditions such as warts (including genital), moles, keloids, molluscum and skin tags. AboutFACE - INGREDIENTS: frankincense carterii, frankincense frereana, frankincense serrata, opoponax myrrh, palo santo AFFINITY FOR: digestive system, respiratory system, circulation, skin, cellular structure and strength, urinary tract, particular affinity for the earth, wood, and air meridians, crown and third eye chakras, integrity of the celtic grid (energy structure) APPLICATION: LeAboutFace can be applied to any area of the body, used in the bath, and is very nice when diffused. AGELESS - INGREDIENTS: frankincense, helichrysum, lavender, litsea cubeba, opoponax myrrh, palmarosa, rose, sandalwood, zanthoxylum AFFINITY FOR: nervous system, lymphatic system, immune system, circulatory system, skin, yin energy, heart chakra, earth meridian, cellular structure and strength APPLICATION: LeAgeLess should be applied to the skin of the face, neck, hands, and arms (and anywhere else you would like). A carrier oil containing 10% of jojoba can bring a little extra emollient value to this blend. BabyMe - INGREDIENTS: bergamot, chamomile Roman, palmarosa, rose, rose geranium, rosewood, ylang ylang APPLICATION: LeBaby Me is usually applied diluted with distilled water or carrier oil, especially for frequent use or application over larger areas of the body. LeBaby Me is appropriate for all skin types. The type of carrier oil you will use will depend on the type of skin you have. This blend is very relaxing when added to a bath. Sego Lily - INGREDIENTS: copaiba balsam, grapefruit, rosewood, vanilla APPLICATION: Diffuse or wear as a perfume. Diluted, LeSego Lily makes an excellent massage oil and is excellent in the bath.